So I decided to add some cabinets. I had already made some new drawers for the restoration of the other kitchen cabinets. I had to replace a couple of drawers, so having experience with those I decided to go for it and add some new cupboard space I also decided to fill in the half wall area with some shelves. As you can see they are sort of old school, retro style. 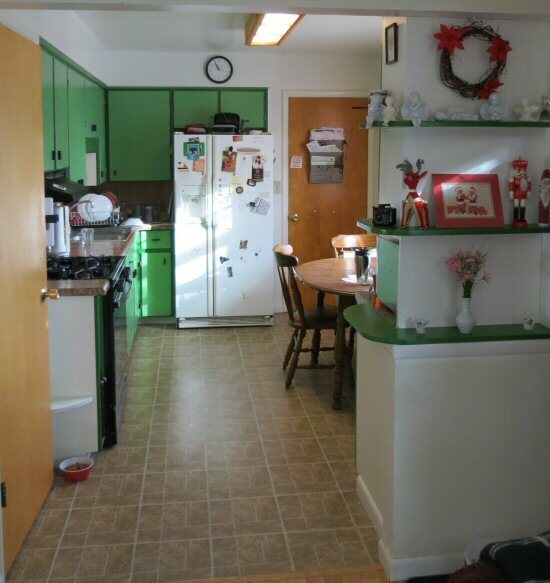 The house was constructed in the early 70’s, and I think they are original. 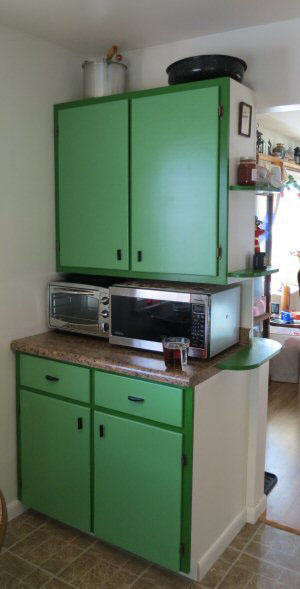 When I was planning on redoing the kitchen I shopped around for new cabinets. But everything I found was either way out of my price range or super cheap particle board construction. So I decided to restore what was there, hardwood pine and real plywood. It made more sense to rework the old stuff then install cheap, crappy new cabinates. I think they turned out really nice! It freed up some counter space by the stove that the toaster oven was taking up and it’s amazing how much more cabinet space was created. It’s been a whole week and they haven’t been filled completely up. 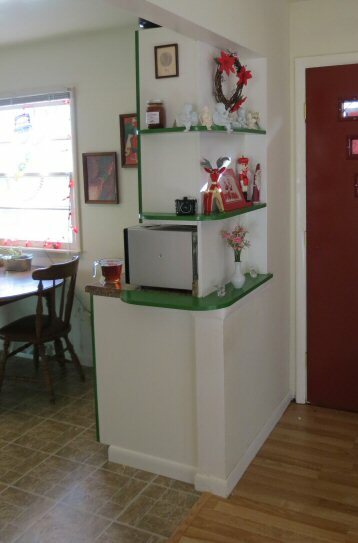 Here is the side view of the shelves. All in all I think it turned out rather nicely! Oh, and we have a new stove too. It is so nice to have an oven that isn’t 100 degrees off. Sweet 3D Calvin & Hobbes Snowmen!!!! Hey for all you out there that need and love a train running around you Christmas tree. Here is a great site, LionelStore.com. they have some great stuff. They also have some great Halloween themed stuff too. Wheat free quiche you say, how can that be? Well it is actually pretty easy. 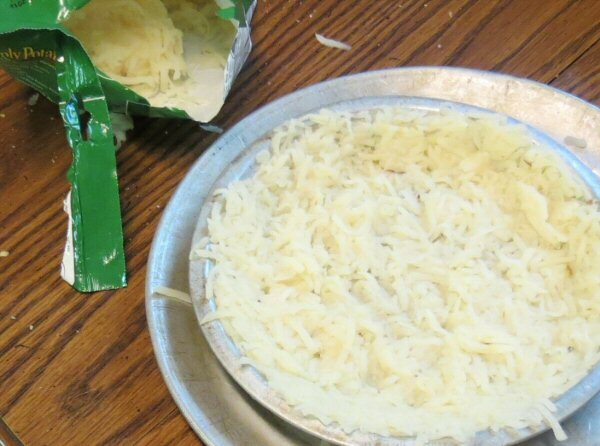 Instead of a flour crust I used shredded hash brown potatoes. 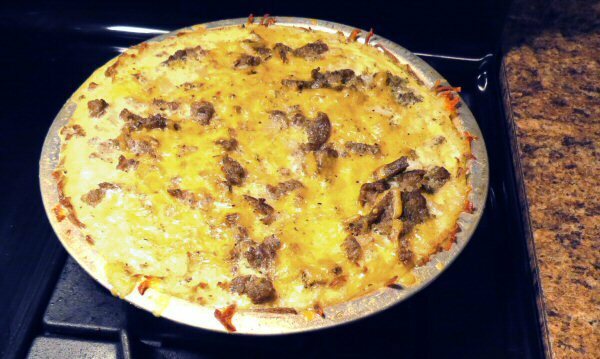 Since this was a hash brown potato crust quiche I decided to stay with the breakfast theme and used sausage for the meat and Colby-Jack cheese. Otherwise the ingredients are the same as my previous Quiche post. I tried browning the hash brown potato crust in the oven. I wasn’t crazy about it. The edges browned but not the inside. The next time I will brown them in a large pan and turn them out in to the pie pan. It turned out looking just as great as the other quiches. Albeit a lot more yellow then the Quiche with Swiss cheese. 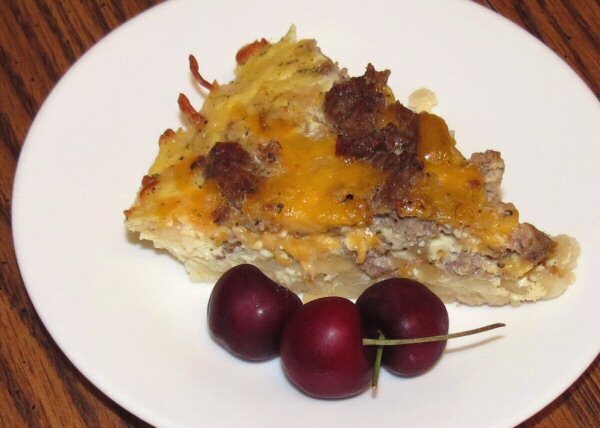 It was just as good as the other quiche that I prepared that day, as proof the wheat allergic chef only had a chance for one piece before my son and his friends wolfed down the rest. He is still getting used to the idea I’m not supposed to eat wheat, or that he should clean his room, pick up his stuff, and so on, and so on….. So if you want a wheat free quiche give this method a try, just brown the hash browns in a pan over the stove and turn them out into the pie pan. I haven’t trid the “on the stove turn it into the pan” thing myself so if you do let me know how it goes. Ever have to have everything just so? 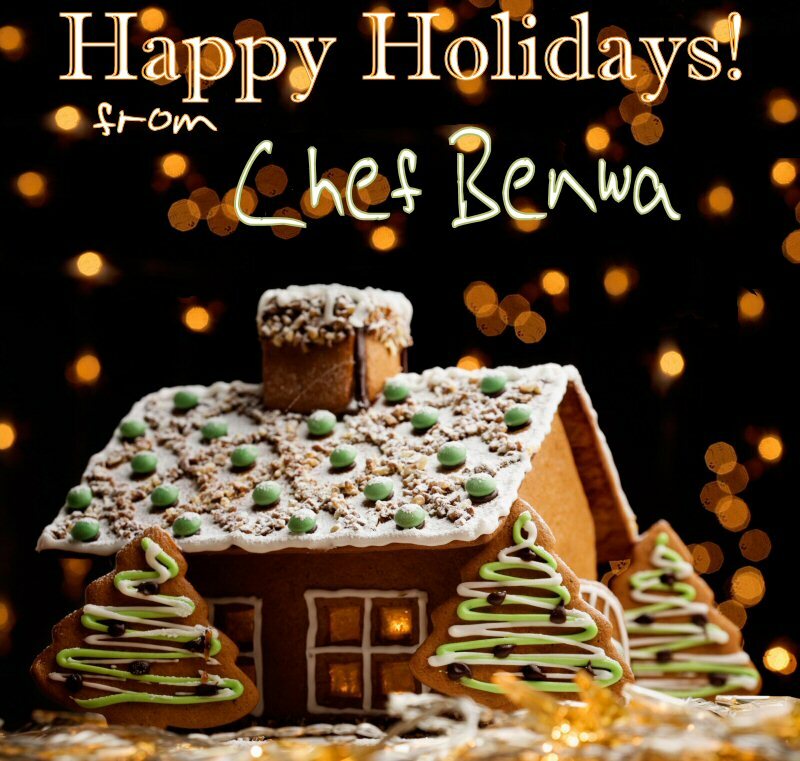 Does your culinary professor make Gordon Ramsay seem like a teddy bear? Well how about The Obsessive Chef’s cutting board. “Do you obsess over the accuracy of your juliennes and batonnets? Or perhaps you’re a culinary student whose chef instructor doesn’t tolerate uneven brunoises? 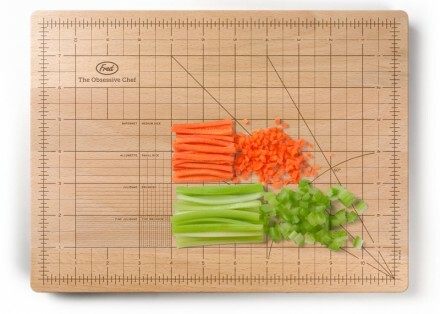 Then, The Obsessive Chef Cutting Board is here to help. What Is It 07/04/2012? It’s A…. Hey can you guess what this is? Usually when we play this game it is some old do-dad that no one can remember what the heck it was used for. This time it is brand new, just bought it yesterday, it was on clearance. 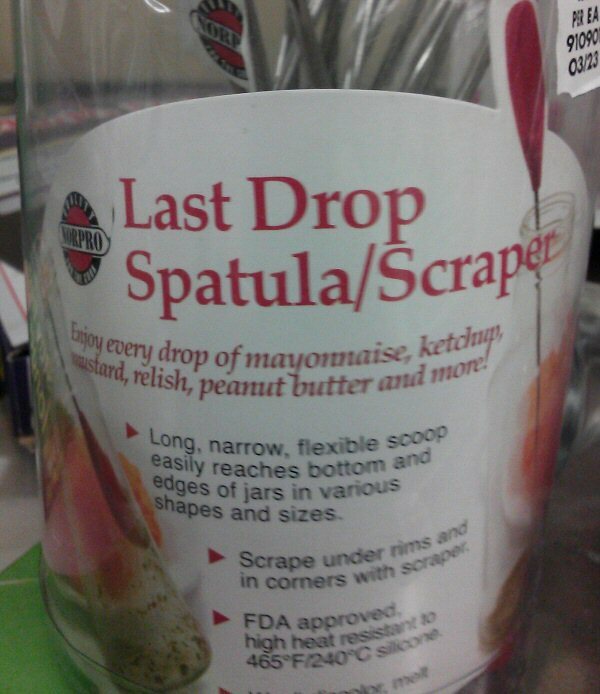 No one got it right, It’s a Last Drop Spatula……..
And why, in my opinion, was in the clearance pile. If someone is so tight that they need, or want, to scrape the last bit of anything out of a jar or can they most certainly won’t spend money to buy something to scrape it out. They will find something they all ready have to do the job. All rules and regulations that may or may not apply where ever you live and/or I live apply or don’t apply as regulations specify or don’t specify. 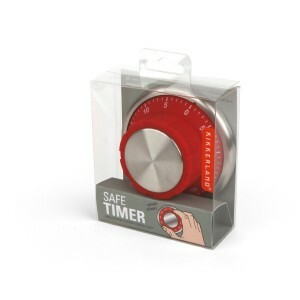 It’s a Kikkerland Safe Kitchen Timer. Not your old run of the mill timer, it looks like a Safe Combination dial. Pretty clever, in a quirky sort of way! Here is a great post on Green Peppers and their various colors by fellow food blogger Vicky Ferguson. I always wondered how they got all those pretty colors. Bell Peppers in Color; What’s the Difference? You know those places in your kitchen that don’t always get wiped down, those little nooks and crannies that just somehow get missed. Then the grease, and grim sort of sets up into this impenetrable varnish that just won’t come off. 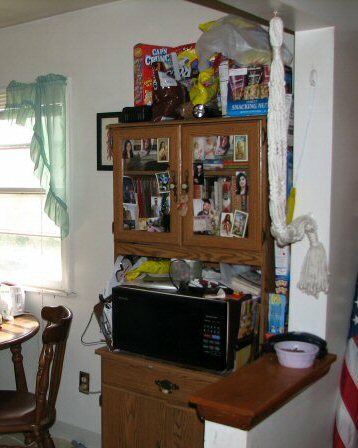 I had a couple of places like that, behind the stove, the bottom of the cupboard directly above the stove. This junk was stuck on these surfaces better than the paint. I actually tried a paint scarper to get it off. No other cleaner, solvent, steam, or mechanical force would remove this “Krud”. As for solvents I used Paint Thinner, Actone, even Methyl Ethel Keaton. Nothing worked until I picked up a bottle of Krud Kutter at Menards. I had given up on it and was ready to yank off the back splash and nail another board under the cupboard above the stove. No More! Krud Kutter does a great job of removing this stuff.